With the Rachel Maddow disaster, the subject of Trump’s tax returns have been brought to the forefront again. Most in the MSM don’t search for, or care about finding the real answer of why the President hasn’t released his returns. All- along President Trump insists he will not release his tax returns until he the IRS Audits of his taxes are over. Many Trump bashers in the media, such as Fox News’ Shepard Smith point checked with the IRS and point out that he is allowed to release his returns while he is under audit, which is 100% correct. Since they were given the answers they wanted, these anchors never consult with CPAs and or tax attorneys to find out whether or not releasing his tax returns are advisable. When he first announced that he wouldn’t release his tax returns till the audits against him were over, I consulted with a few CPAs. What I was told was, while there is no rule against him releasing tax returns while under audit any CPA/Tax Attorney who let’s him do that should be disbarred (whether or not they are the years being audited) . When someone as wealthy as President Trump is audited there is likely a team of people at the IRS going through his returns for the audited years looking through the returns for something to nail him with. But when a candidate releases tax returns the team of people looking for the slightest mistake goes from the team at the IRS auditing, to the DNC, newspapers, magazines, tv networks, bloggers, etc. And not just for the audited years but for every year released. If the media finds something in a year that the IRS isn’t auditing the IRS can add that year’s return. While the media digging through someone’s returns doesn’t really matter when there is no audit in place, why should anyone take a chance on giving the auditors more red meat. And if the media finds something, they may be criticizing a totally legitimate item. I would also suspect that as the IRS was politicized under Barack Obama (Tea Party scandal), I would not be surprised to learn that Trump was selected for audit because of his history of publicly criticizing the former president. And as long as President Trump is being audited IRS director John Koskinen has job security. Many people have asked why Pres. Trump hasn’t fired IRS director John Koskinen, who has blocked the investigation into the IRS/Tea Party scandal while showing a disdain for Congress and the American people. A possible reason is that the President does not want to appear to influence his audit. 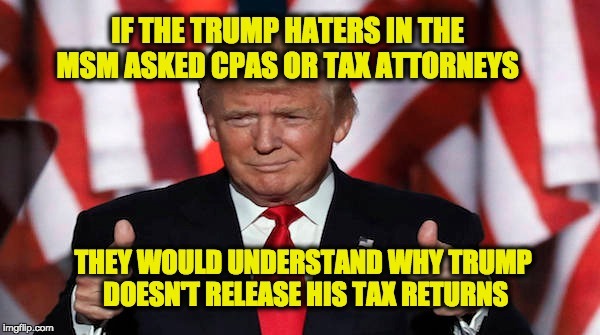 In the end, while the Democrats and Trump-hating reporters have used the non-release of President Trump’s tax returns this to their advantage, wondering what Trump is hiding. If they asked the question (or wanted the answer they would know the real probable reason Trump wasn’t releasing his returns. The truth is if any one of them were a politician being audited, their attorney would give the same advice–don’t release your tax returns (and if they didn’t get that advice they should fire the attorney asap).